Curry Chevrolet expands into Westchester County as the storied Curry Chevrolet facility on Central Avenue in Scarsdale opens. 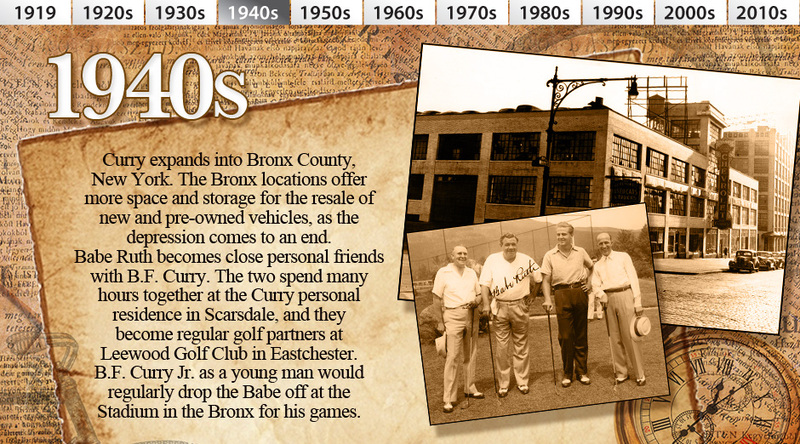 B.F. Curry Jr. is now a prominent figure in the organization under the tutelage of his father. The dealerships iconic design featured sprawling 30 foot windows and 50s deco exterior with scripted art deco illuminated signage. The adjacent parking facility featured a drive in style outdoor covered vehicle area. 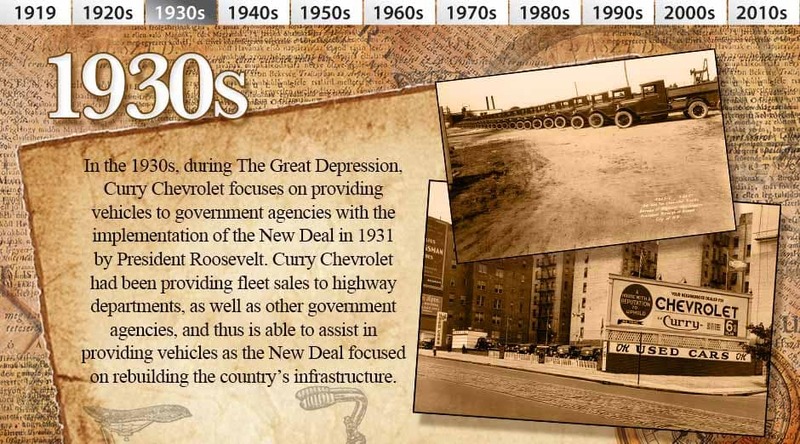 The Chevrolet facility was completely renovated in 2013 employing local union trades people. The new facility was built to conform to the new standard of facility requirements by General Motors. The original 1958 building signage that was in place for 57 years was removed and refurbished. This original iconic sign is proudly displayed inside the 2013 constructed showroom as a reminder of the historic significance of this storied Chevrolet franchise. 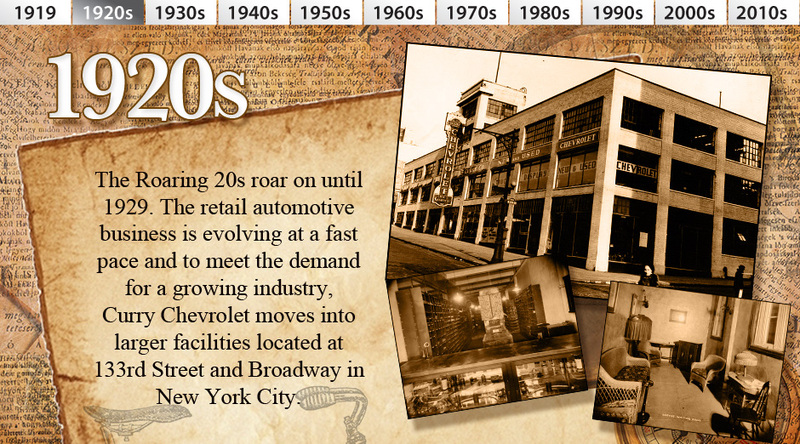 A Dodge franchise and facility is opened on Central Avenue in Scarsdale. 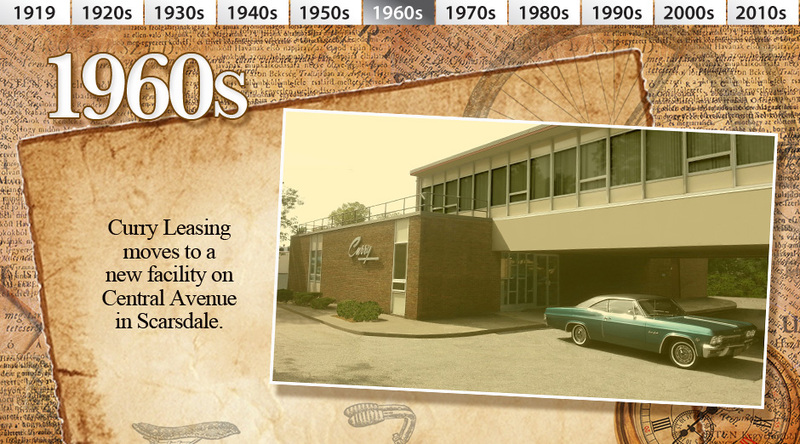 Scarsdale Dodge became one of the largest Dodge dealerships in the New York Region. 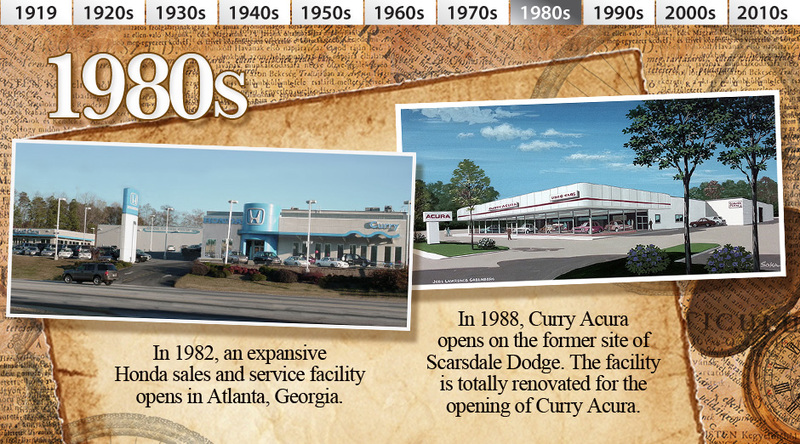 In 1982, an expansive Honda sales and service facility opens in Chamblee, Georgia; a northern suburb of Atlanta. The Curry Honda dealership in Georgia is now one of the largest and most successful Honda dealerships in the Southeastern United States. 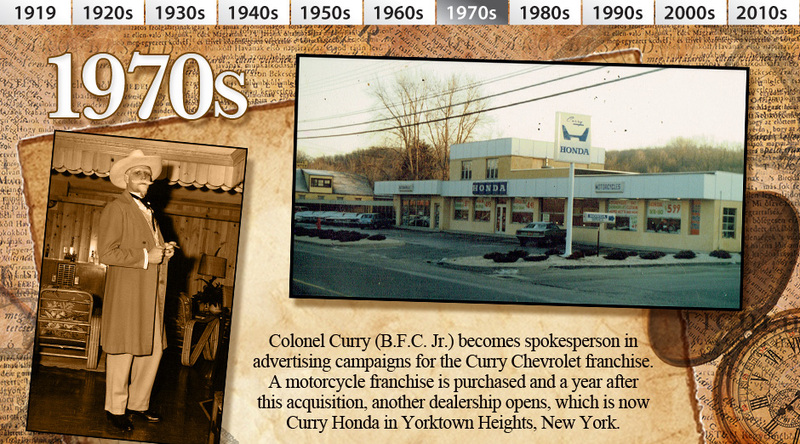 In 1988, Curry Acura opens on the former site of Scarsdale Dodge. The facility is totally renovated for the opening of Curry Acura. Curry Acura has been awarded Acura’s Precision Team Award for outstanding sales and customer satisfaction 10 times. 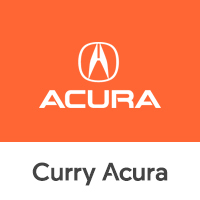 Curry Acura now ranks in the top ten of all Acura dealerships in the entire country for Acura sales and customer satisfaction. In spite of a worldwide recession and the financial meltdown of 2008, which severely impacts the U.S. economy, Curry Automotive comes out of the biggest recession since the Great Depression of 1929 in a growth mode. This expansion model is facilitated through the impeccably well-timed execution of industry insight and expertise by the dedicated and congenial General Managers at each dealership alongside the Curry Automotive Executive Committee. Curry Automotive is positioned to expand and does. Curry Automotive makes difficult yet necessary business plan modifications during a seven year period that positions the Curry Organization in the growth mode to acquire dealerships when the opportunity is presented, as well as renovate and upgrade their franchises. 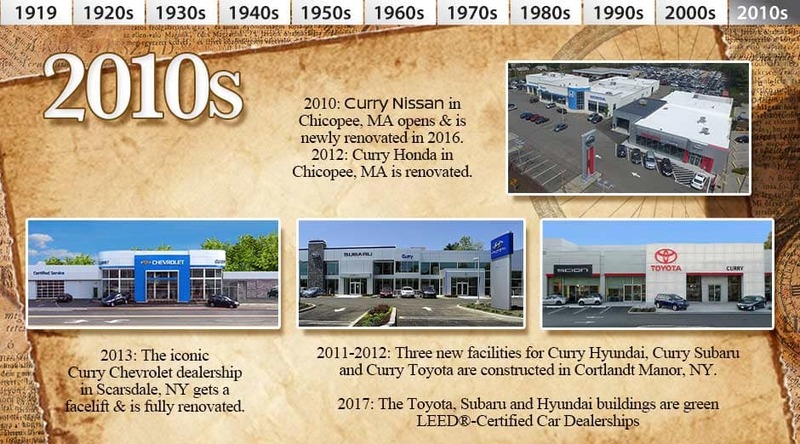 In December of 2010, Curry Nissan in Chicopee, Massachusetts opens. 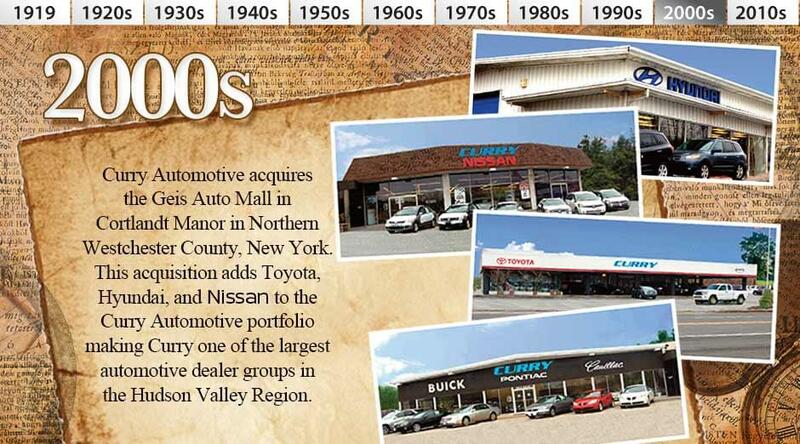 The Nissan dealership is added to the same 10 acre site as the Honda Franchise. During 2011-2012, three new facilities are constructed on the 7 acre site located on Route 6 in Cortlandt Manor in northern Westchester County, New York. The two year project was completed by local union trades people. The new facilities are home to Curry Hyundai, Curry Subaru and Curry Toyota. The new 7 acre complex is one of the largest single point automotive retail location from New York City to Albany, New York. Remarkably these new facilities are LEED®-Registered Car Dealerships, making them the area’s first green automobile dealerships. Curry Automotive has a made a commitment to be environmentally conscious in all business practices. In November 2012, Curry Honda in Chicopee, MA opens a newly renovated 30,500 sq ft facility, consisting of 2 floors with expanded service to include 3 enclosed service lanes and 21 service lifts plus a state-of-the-art customer lounge with Wi-Fi access, refreshments and a Honda information center. 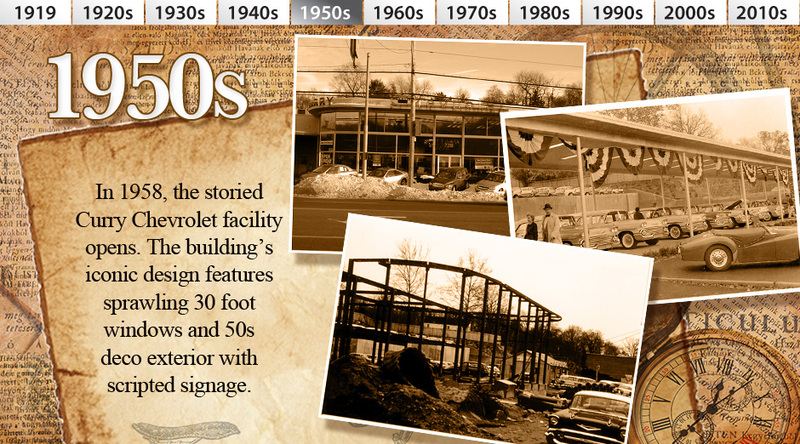 In October 2013, the iconic Curry Chevrolet dealership in Scarsdale, NY gets a facelift and is fully renovated to include a large, comfortable customer waiting area by the service department. 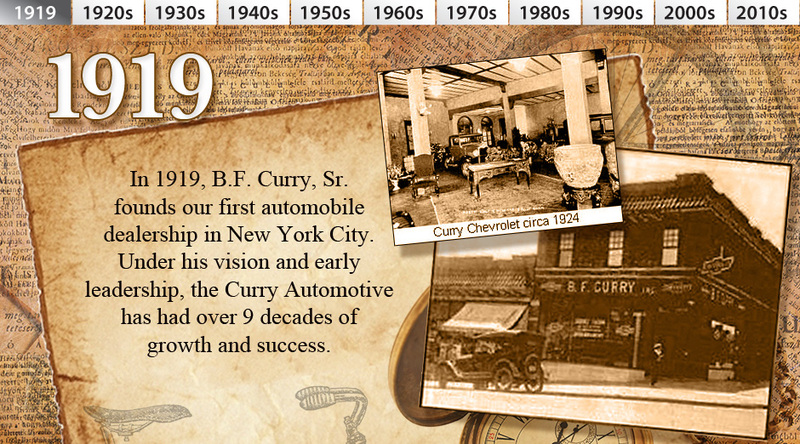 In 2015 Curry Automotive acquires two Mercedes-Benz Centers and a Toyota dealership in the New York Tri-State Region. 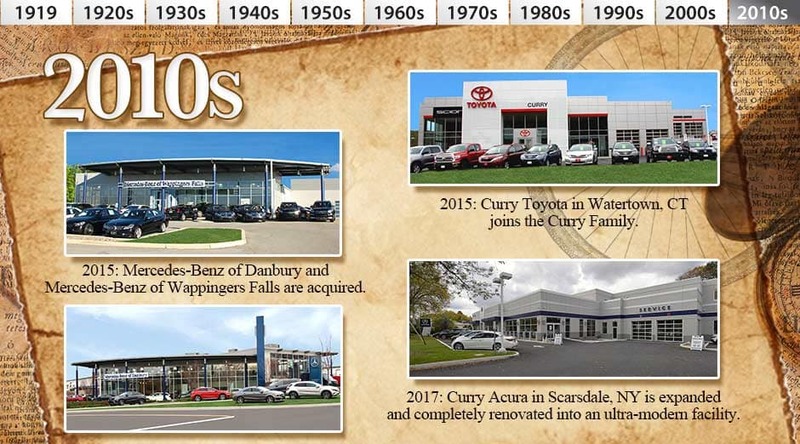 Mercedes-Benz of Wappingers Falls and Mercedes-Benz of Danbury, both with their Sprinter commercial vehicle line ups, plus Curry Toyota in Watertown, Connecticut bringing the total to 15 in the Curry Family of Dealerships. In the acquisition, Curry Automotive also obtained two state of the art body repair shop facilities: Silver Star Auto Collision located in Danbury, CT and Storm Auto Body, located in Watertown, CT. In making the announcement, Mr. Curry stated, “When we became aware of the availability of two successful luxury franchises representing the top Luxury Brand in the Country, we felt it was a great addition to our portfolio of dealerships. We have always operated our dealerships with the high-line mentality by offering the ultimate customer experience whenever a guest enters one of our dealerships.” The Mercedes-Benz Centers are among the best there are in award winning customer service. 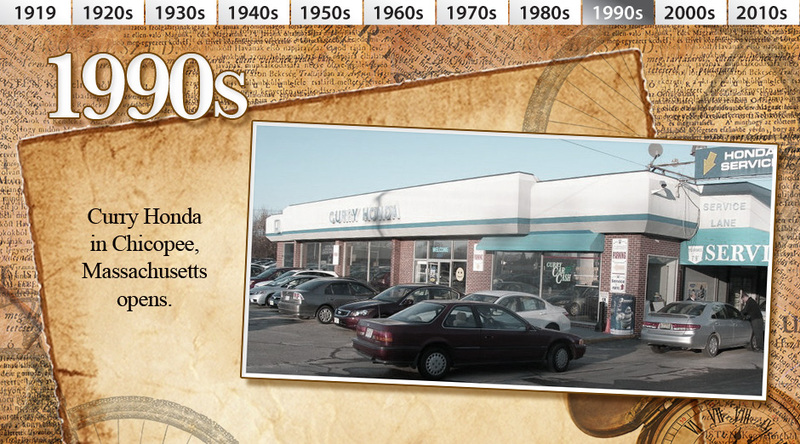 The Toyota dealership is situated in a brand new state of the art facility in a rustic New England community neighboring New England’s ninth largest city, Waterbury. In the fall of 2016, Curry Automotive starts selling the newly independent Genesis brand as its own franchise at the Toyota, Hyundai, Subaru lot of dealerships in Cortlandt Manor, NY.